You can control the quality and quantity of the ingredients. No one can be hundred per cent sure about what goes on exactly into commercial pasta. If you want to be sure about what is in your pasta then make it yourself. You can create all kinds of new tastes and colors by adding healthy ingredients of your choice such as spinach, tomato, and even chocolate or anchovies! You save a lot of money. It's true that commercial ordinary dry pasta can be very inexpensive, but as soon as you want to buy some quality pasta or commercially made fresh pasta, you have to pay a lot more, and the costs add up! It's very easy and fast! Making fresh pasta at home is a child's play, and once you get the hang of it, pasta can be readied for cooking in lest than 15 minutes! It 's also a lot of fun to do! Yes, once you start making your own pasta at home, you will find it so much fun that you will want to do it as often as possible. For families with children, it is an excellent way to get your children participate in this activity as they will love it. To start making pasta at home, the first thing you need to do is equip yourself with a basic pasta maker. There are many manual and electric pasta machines out there. Unless you already own an electric mixer or food processor, such as the KtchenAid Stand Mixer, for which pasta maker attachments can be purchased, there is no need to opt for the electric type. 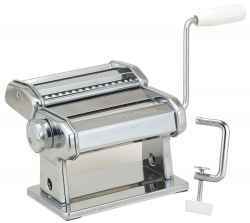 Great chefs have been using manual pasta makers for the longest time and have been creating terrific pasta. One thing is for sure, manual pasta machines are definitely cheaper and give you that authentic and fun pasta making experience. Also nothing guarantees that electric pasta machines will produce better tasting pasta. On the contrary, many Amazon customers have stressed the fact that they achieved better results with manual pasta machines. Because the majority of people looking for pasta machines will most probably opt for manual ones, we will consider here mainly the hand-cranked units. In order to help you compare pasta machines, we will focus on the Imperia, Atlas and Prime Pacific brands which were the most popular bought by Amazon customers at the time this article was written. If you want one the best pasta machine out there, then you will probably be very happy with the Imperia pasta machine that comes complete with precision-engineered pasta rollers and an Imperia recipe booklet. This machine is one of the most popular pasta makers bought by Amazon customers. No matter which pasta machines review you look at, you can find only praise for this little wonder. It is made of heavy duty, chrome-plated steel. It measures 9 x 12.5 x 6.5 inches and has a 6-inch wide roller with double cutter head that makes wide fettuccine (1/4-inch) and thin spaghetti (1/16-inch) noodles. It is equipped with an easy-lock dough roller adjustment dial, a fancy wood grip handle, and can make a large variety of noodle styles thanks to additional attachments available for purchase separately. It also comes with a clamp to securely attach it to your counter top or table to facilitate the use of the hand crank. Important to note that this machine had received a 4.5 star rating on Amazon at the time this article was written due to its remarkable durability as well as ease of use and maintenance. This is a well made pasta machine, small and easy to store, with all its parts well designed to do their intended job - making perfect pasta! This Atlas pasta machines are just as popular as the Imperia and feature narrow and wide cutters that make 4 types of pasta--flat dough sheet, fettuccine, spaghetti and tagliolini. 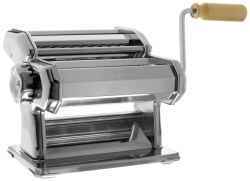 It is made of heavy duty, chrome-plated steel, and the pasta machine's rollers are nickel-plated to resist corrosion. All the gears are made of case-hardened tempered steel for long life. It also features a hand-crank and clamp with ABS plastic handles, and a detailed instruction book with color photos and recipes. Additional attachments--including a motor-driven unit--are available separately for a wide variety of noodle styles. The Atlas pasta machine measures 8 by 8 by 6 inches. The easily adjustable, 9-position dial regulates thickness of pasta dough. Maintenance is a breeze as all you need to do is wipe it clean. Like the Imperia, you will find that this machine produces perfect pasta, and it is a lot of fun to use. But you'd have to be patient if its your first try at making pasta. It takes a couple of tries to get the hang of it, but the machine itself will not give you any problems. Just follow the directions on how to use and clean it, and you will create great pasta. Our opinion is that Atlas and Imperia machines are almost equally good with Imperia a small notch above its main rival the Atlas, because it feels and looks like it is a bit more solidly made. So, buying either pasta machine, you would be making a good choice. The Prime Pacific pasta machine measures 8 by 10 by 7 inches with a stainless-steel body and stainless-steel cutting blades. Its adjustable steel rollers have 7 thickness settings. It also comes with a removable handle, counter clamp and recipe book. The adjustable steel rollers can knead pasta dough into smooth four-inch wide sheets of dough, perfect for making ravioli or cutting into lasagna noodles. It is also possible to slide on the stainless steel cutting attachment to make spaghetti or fettuccine noodles. The Prime Pacific machine is good enough for occasional use, and it does its job well-enough for the price you are paying. It also comes in stainless steel which is great for durability and ease of cleaning. 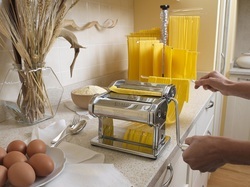 However, if you are planning to use your pasta machine often, you may want to upgrade to an Imperia or Atlas. So which Pasta Machine to Get? Based on the above pasta machines descriptions, if you are going to be serious about making pasta at home, and if you will be using your machine at least a couple of times a week, you should get either an Imperia or Atlas machine for better durability, ease of use, and choice of additional attachments that you will need as you become more of an expert. Note however that as explained above, even though both machines are excellent, Imperia stands a notch above Atlas. On the other hand, if you intend to use only occasionally your pasta machine, and you do not intend to create different sorts of pasta, there is no serious reason why you should not save some money by buying a Prime Pacific machine. Please click the selected pasta machine below to check the price or to purchase. Pasta racks are very useful to dry the pasta you make at home. You could dry many pounds of fresh pasta all at once. Numerous recipes for pasta doughs using ingredients such as buckwheat and whole wheat flour, spinach, roasted red pepper, and even squid ink and chocolate! Beautifully illustrated instructions for preparing the dough for all kinds of pasta, including gnocchi, cannelloni, lasagna, ravioli, pappardelle, tagliatelle, and many of other types of pasta. Within this book, every conceivable type of Italian pasta or Asian noodle is presented. This comprehensive volume includes recipes for dried and fresh pasta, gnocchi, dumplings, and even chocolate pasta. It features step-by-step instructions for making and cooking pasta with recipes incorporating cheese, fish, meat, game, vegetables and poultry. Impeccably illustrated in full color, this beautiful book is perfect for adventurous cooks who like to do it all from scratch, though there is also an excellent guide to preparing dried pasta. The book describes clearly how to make fresh pasta, whether cut by knife or pasta machine, and contains directions so clear that even a novice can easily follow them. The recipe list includes a wide array of both Italian and Asian, ranging from the simple and relatively inexpensive to the more elaborate and gourmet. This book is a James Beard Cookbook Winner.